Over a 200-year period thousands of newspaper reports, town and county histories, letters, photos, diaries, and scientific journals have documented the existence of an ancient race of giants in North America. Extremely large skeletons ranging from 7 feet up to a staggering 18 feet tall have been reportedly uncovered in prehistoric mounds, burial chambers, caves, geometric earthworks, and ancient battlefields. Strange anatomic anomalies such as double rows of teeth, horned skulls, massive jaws that fit over a modern face, and elongated skulls have also been reported. Many of these discoveries were sent to the Smithsonian Institution in Washington D.C., seemingly never to be heard about again. The Smithsonian's own records describe at least 17 giant skeletons in annual reports. This book examines a possible cover-up initiated by Smithsonian scientists starting in the late 1800s. The origins of “the tall ones” has been shrouded in mystery for centuries, but this book reveals where they came from, why they got so large, and the reason for their downfall, using the latest scientific research, genetic data, native myths, news reports, and ethnological research. This has become one of the most gripping stories of the last few centuries and for the first time the truth of the giants of North America has been revealed. This book also reveals: How early explorers to America witnessed these giants firsthand, including Sir Francis Drake, John Smith and even some of the early presidents; Legends and myths that talk of cannibalistic, red-haired giants; Strange inscriptions, metal armor, mummified remains, and sophisticated technologies buried with the skeletons; How secret societies such as the Rosicrucians, Freemasons and Theosophists all claim the existence of giant humans in the past as historical fact in their literature; and How the giants may be connected to the Denisovans from Siberia, the Nephilim of Bible tradition, and other ancient cultures. 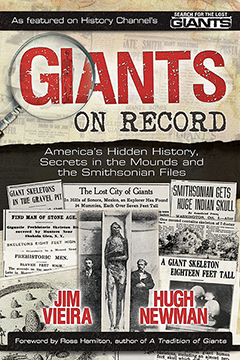 GIANTS ON RECORD: America's Hidden History, Secrets in the Mounds and the Smithsonian Files By Jim Vieira and Hugh Newman. 420 pages. 6x9 Paperback. Illustrated. 8-page color section. References. Footnotes.